SOPA is the abbreviation for “Stop Online Piracy Act“. It was introduced on the 26th of October 2011, and since then, it has caused a real storm all over the Internet. Okay, online piracy is bad someone would say, that’s true, but SOPA will not only stop it but most probably this act would kill most of the biggest and cool sites like Wikipedia, Facebook, Reddit, etc and censor your online life. As I just mentioned, I am NOT a supporter of online piracy, but also I do NOT support the SOPA, because it will cope with legal rights infringements the same way you would get rid of bugs in your home by blowing your house up! That’s the big deal here. What does this mean? SOPA will give content creators enormous power in the World Wide Web. This act will make it legal for Walt Disney for instance, to shut down any site out there showing Mickey Mouse movies, and the shocking part of this is that they could do this with no efforts. Only an honorable e-mail to the ISP of the “bad site” would be enough for it to be shut down, to be delisted from search engines, its bank accounts to be blocked, etc. After Google (or any other company) receives a letter of this type, it would be obliged to react in 5 days, or it will break the law and could be sued and shut down, too. And this may happen not only in the US, but all around the world. And there is more – “Bad site”‘s owners in the US could be sued and sentenced to 5 years in jail for streaming illegal content. This creates enormous potential for abuse. Imagine what would happen if Google decides to remove from search results any site displaying video content, except its own – Youtube… World Wide Web would become World Wild West! Big companies would have the opportunity to destroy all of their smaller rivals. If you are a blogger and place a link to a site that has infringed on someone’s content, you will be obliged to remove this and will not be allowed to do so anymore, because you will be breaking the law. Many big sites like Facebook, Google, Twitter, Wikipedia will have to remove big parts of their content. You will no longer be able to post whatever you want on your wall on Facebook, there will be no freedom on the Internet. SOPA has also an “anti-circumvention” clause, which says that telling people how to work around the act is as breaking it! I don’t like this. The Internet is designed to be a place, where information if free, open and where anybody is allowed to express whatever she wants. Now it’s possible for it to become a dangerous place, even for bloggers around the world. They will not be able to express their thoughts freely if this act is passed. Big social media sites could be easily shut down, just if Uncle Sammy decides, that they are “dangerous for society”. SOPA will censor your online life to an extent, that it will be very likely destroyed. The SOPA debate will be resumed in February 2012 by the authorities. 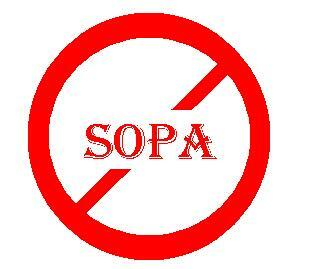 If you don’t support and like SOPA, you CAN do a lot against it! Share this page with your friends using the social buttons below, vote for it. If you have a blog, post about SOPA. Everybody could support this cause somehow. You can also do this here: http://americancensorship.org/.